Facebook users, you may not know it yet, but someone has made a video of your life. To celebrate the 10th anniversary of its founding, Facebook has created personalized videos for hundreds of millions of its users, reports wpbf.com. Titled “A Look Back,” the 62-second videos were posted live Tuesday, February 4, 2014—exactly 10 years to the day since Mark Zuckerberg and four of his Harvard classmates founded the social network in 2004. 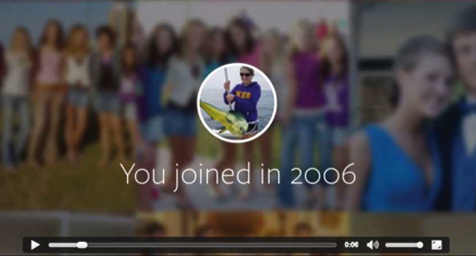 The videos include the year you joined as well as a sampling of your photos and most-liked posts. Users who’ve posted less content will view a collection of still photos or a simple thank you card instead. You can view your personalized video at Facebook.com/lookback. Unless you share it on your timeline, your video will be available for only one month. For those concerned about revealing too much, an “Edit Your Movie” feature allows you to remove posts you’d prefer to keep private. Those clips that aren’t shared on a timeline will be viewable only to the user. The customized videos were created by a small team at Facebook who spent months editing together the videos and making sure the network had the resources to support them. Keep up with the latest in Facebook and social media marketing. Contact MDG Advertising today at 561-338-7797 or visit mdgadvertising.com.